This bike front bag is no zipper design, roll top closure, very convenient to use. The capacity can be adjusted from 2L to 3L as your different needs. 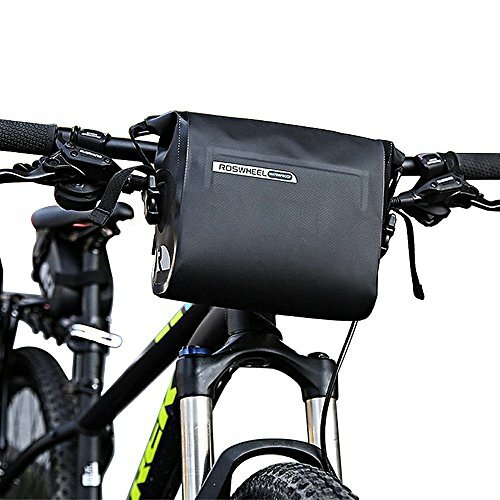 This bicycle bag is easy to attach to your bike handlebar, convenient to carry anywhere as well. Perfect for storing cell phone, wallet, camera, maps, personal goods, spare tube, tools, etc. Allnice strive to provide exceptional products and services. Have any questions, please contact us immediately so that we may resolve the issue for you. 【Dimension and Guarantee】Size: 7.8x10.6x4.3inch/20*26*11cm(L*H*W). Weight: 280g. We stand behind our products 100% with a One Year Warranty. We do offer a 30-day money-back guarantee. If you have any questions about this product by allnice, contact us by completing and submitting the form below. If you are looking for a specif part number, please include it with your message.